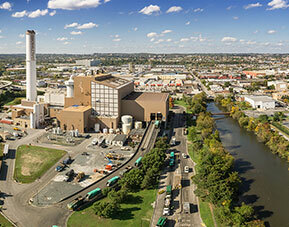 Waste-to-energy facilities provide safe everyday waste disposal for towns and cities across the US and UK. These facilities deliver clean, renewable electric power to major utilities for distribution to hundreds of thousands of homes and businesses. As valued corporate citizens and neighbors, Wheelabrator facilities contribute to the economic and civic vitality of their host communities. Wheelabrator also operates a variety of waste fuel facilities designed to generate electricity using an assortment of waste fuels, including waste wood and waste coal. In addition to producing electricity, some of these facilities also produce steam sold to nearby government and commercial establishments. We also recover metals for recycling at two advanced metals recovery systems and one central upgrade facility.